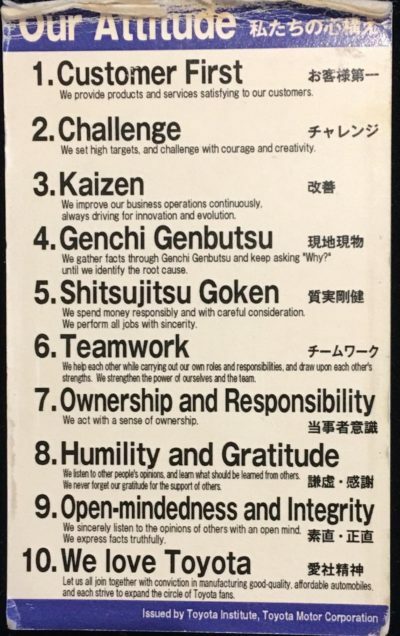 “What does it really mean to say that lean thinking is not uniquely Japanese? First, it indicates that not all Japanese companies are ‘lean.’ […] Secondly, we have successful examples of lean applications all around the world – not just in Japan […]. We know these things to be true. The left funnel represents a selection of key ingredients that, combined, have led to the creation of Toyota’s way of working. 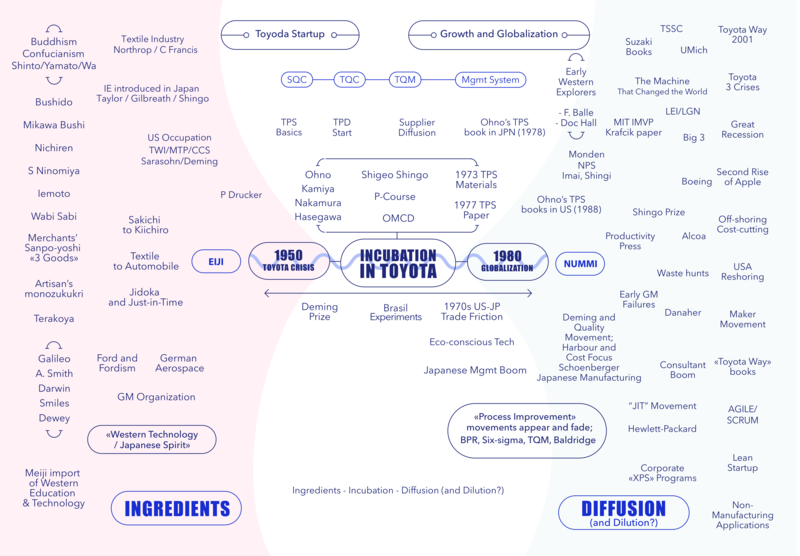 The spiral in the middle of the graphic represents the actual genesis of the Toyota Way, TPS, TPD, TMS and lean thinking, which can be traced back to a 30-year period of incubation, between 1950 and 1980. The right funnel represents the diffusion of this body of knowledge around the world, which started around the time of the NUMMI experiment, in 1984. John Shook’s double funnel is reproduced here. Click on it to enlarge or view it on Planet Lean to click on each item and see more details. Michel Baudin‘s comments: As usual, John Shook’s post is both grounded in deep knowledge and well written. The infographic is also clear and the popup boxes of information attached to each item on Planet Lean are a valuable enhancement. But I still don’t buy everything in it. Michel Baudin‘s comments: Is there science to Lean, TPS, or, more generally, manufacturing? There is definitely technology and there is management. Technology is about getting inanimate objects to do what we want them to; management, about working with people. Science is not about getting anything done but about understanding how nature works. Michel Baudin‘s comments: The title of the article appears to promote irrational decision making, which should be a hard sell. Michael Ballé seems to know what a goldfish is aware of, and I wonder how. 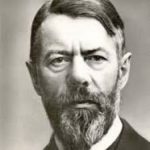 According to Etymology OnLine, “rationality” actually is a 17th-century French word and, to this day, means the quality of being based on reason, not of being “aligned with a goal.” The German connection, perhaps, is Max Weber who described goal alignment as one of two subcategories of rationality in social behaviors (“Zweckrationalität”) in Economy and Society, a book published in 1922, after his death — that is, in the 20th century, not the 19th. If you are a Lean expert, no one expects you to discuss German philosophy. If, however, you choose to go there, it helps if you start with a paragraph that withstands a 5-min fact check on Google. For an analysis of management decision making, I prefer to start with what Kaoru Ishikawa said in his book on TQC. I don’t understand why Jim Womack restricts the discussion of stability and innovation to the car industry and the comparison with other companies to “VC-backed auto start-ups” that are short of funds. Toyota’s leaders grew the company by doing what they had to do to navigate the Japanese car industry. It is, in retrospect, a spectacularly successful model and worth studying. It is not, however, universally relevant. Here in the heart of Silicon Valley, we view it as the worldwide hub of innovation, not the Nagoya area. Local entrepreneurs, VC-backed or not, have given us multiple generations of companies that are not exactly short of cash, like Hewlett Packard, Intel, Apple, eBay, Netflix, Google, Facebook,… Some of them are dabbling in the auto industry but most of their revenues come from elsewhere. 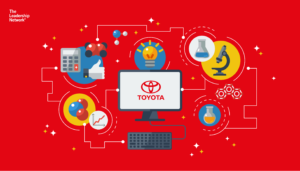 It doesn’t make their practices and business models any less worthy of study than Toyota’s. According to this author, any company with “thoughtful management” is lean. He must, therefore, conclude that Alphabet/Google is lean today, and that so were HP under Bill Hewlett and Dave Packard in the 1960s and GM under Alfred P. Sloan in the 1920s. Sloan, Hewlett, and Packard all were thoughtful managers who conceived and implemented systems that were regarded as models for decades but I have never heard it claimed that they made Google, HP, or GM “lean.” Taken this broadly, the term loses all meaning.